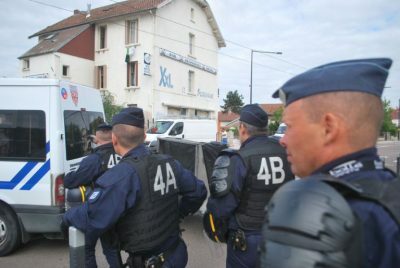 Since May, the activists from local migrant support collective Soutien Asile 21 were negotiating the purchase of the building with its owner. The authorities had been aware of this fact since 20th June. Once again, the state and the government force asylum seekers to be extremely precarious (confiscation of their belongings, sorting and selection for relocation offers, atomization of the forms of self-organization of everyday life, risk of being left homeless, endangering minors …). This occupation was part of a Dijonese movement of support for migrants, which has been working since the opening of the first place in November 2011 to offer temporary housing in buildings which have been left empty and abandoned. Faced with the hardening of the national migration policy that is translated to almost systematic refusals of asylum, in the face of the regular and growing stigmatization of migrants, we reaffirm our total solidarity with all migrants and our undisputed will to will to suppier and welcome them. The newly homeless people were temporarily hosted by two self-managed spaces: Des Tanneries and Free District Lentillères, until more permanent space can be found. The local activists plan to requisition more buildings to house the evicted.